Imagine a video game that has suddenly come to life. Austin Cluetivity is a game that combines state-of-the-art augmented reality technology with a mapped scavenger hunt that consists of trivia like questions, riddles, puzzles, mysteries, and more. Clues to solve the mysteries will be found in both real and animated worlds. Each unique route will consist of popular downtown destinations including the Driskill Hotel and the Congress Avenue Bridge. 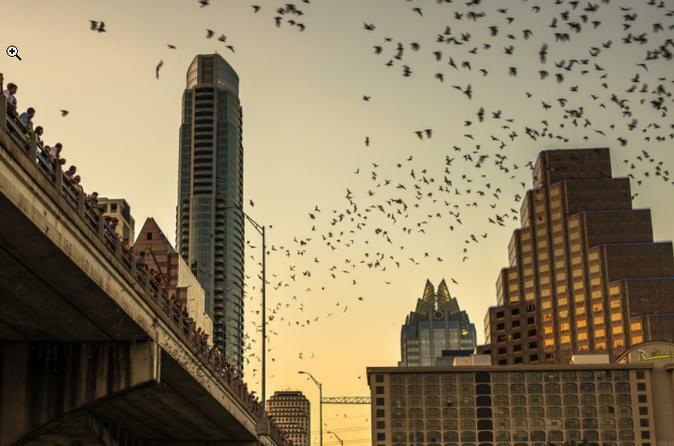 Simply put, people are batty for Austin’s world-renowned Mexico free-tailed bats and their night 2-mile high flight patterns, and feeding frenzy of Austin insects. These bats are the fastest mammals in the world at 99 mph. Pick up your iPad and action pack to play the Congress Ave Scavenger Hunt and Bat Tour. You will have 120 minutes to solve all the riddles and puzzles to save the world from evil monsters. The game involves GPS markers, like a tour yet it is more of a scavenger hunt with the activities that need to be solved to get a world saving score. Enter the augmented reality world by using the unique pattern in your action pack. See the bats in person, live as they fly out from the Congress Ave bridge at dusk. Enjoy an affordable date night or family experience.